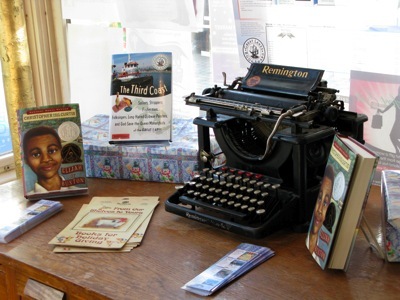 In 2002 the western shore of Lake Michigan became the setting for a cozy mystery series by JoAnna Carl. Her charming debut book The Chocolate Cat Caper introduces readers to 28-year old Lee McKinney, former Texas beauty queen and recent divorcee. McKinney heads to a lakeshore resort town in Michigan to help out her Aunt Nettie, who owns a gourmet confectionary business called TenHuis Chocolates. But things in the village aren’t always as sweet as the mouth-watering chocolates sold in the shop. And when a client dies from a cyanide-laced TenHuis bonbon, Lee turns amateur sleuth. As with all the books in Carl’s series, chocolate recipes and trivia about chocolate are sprinkled throughout. The mysteries are intriguing and McKinney is always engaging, as are her ever-expanding circle of friends and family. Although the books do not have to be read in order, take note that Book One does introduce readers - and Lee McKinney - to the character that will be her future husband. Carl is a pseudonym for award-winning author Eva Sandstrom. Although a native of Oklahoma, Sandstrom has spent the past forty summers in west Michigan’s Pier Cove. While her fictional village is called Warner Pier, to anyone who lives here it seems a lovely carbon copy of Saugatuck – without all the murders. And anyone who has ever visited or lived in the Lake Michigan towns of Saugatuck, Douglas, South Haven, St. Joseph, New Buffalo, Holland or Grand Haven will recognize the wonderful local details that enhance the series. 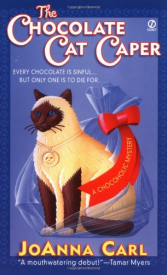 As of June 2013, there are twelve Chocoholic Mysteries whose titles include The Chocolate Bear Burglary, The Chocolate Snowman Murders and The Chocolate Moose Motive. And fans won’t have wait long for the next installment. The Chocolate Book Bandit is due to be published in October 2013. So if you’re heading for the Lake Michigan beaches this summer, any of the books in JoAnna Carl’s Chocoholic Mystery series are certain to keep you entertained and thankful that you’re vacationing - or living - in such a lovely lakeshore setting. 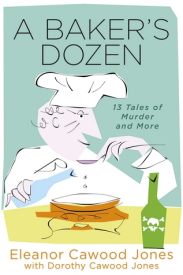 Just about any cozy mystery series set in the South is sure to feature more than its fair share of colorful characters. Iced Chiffon, a breezy summer read, is the first book in Duffy Brown’s Consignment Shop series. Set in Savannah, Georgia, it is chock full of eccentric Southern belles and smooth talking gentlemen. And at the center of it all is an appealing and sometimes hapless heroine who brings to mind Reese Witherspoon and episodes of ‘I Love Lucy’. In the first book of the series, Reagan – named after the President by fervent Republican parents – finds herself recovering from the throes of that aforementioned nasty divorce. Her ex-husband Hollis is now cozy with the bimbo he left her for, and Reagan is trying to hold on to the one thing she retained from the rocky marriage: a beautiful but rundown Victorian house. But soon the bimbo (aka The Cupcake) is found dead in the trunk of a yellow Lexus and Hollis looks to be Suspect Number One. Although still suffering the fallout from signing a terrible pre-nup, Reagan is persuaded to help out her ex. She doesn’t do this out of any lingering fond memories of their marriage, but to stop him from selling her beloved Victorian home in order to pay his legal fees. Complicating matters is Walker Boone, the handsome but ruthless lawyer who handled the divorce for her ex and is now defending Hollis. Reagan vows to never pay a dollar in legal fees to Boone again, and the best way to do that is to find the real killer herself. But since her detective skills aren’t especially honed, she may wind up being the next victim instead. Joining Reagan, Hollis, Walker and Cupcake are a humorous cast of characters that include a ballroom dance teaching aunt who quotes Cher, a dog named Bruce Willis and neighbors who hire themselves out as professional mourners. This is a series that rivals Midnight in the Garden of Good and Evil for eccentric Savannah characters, but it’s a lot more fun. Iced Chiffon is a quick read, so you may want to throw the second book in the series Killer in Crinolines into your beach tote as well. 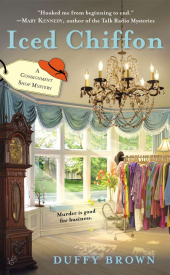 And look for Duffy Brown’s third Consignment Shop mystery Pearls and Poison sometime in 2014. Meanwhile to get through the hot days of summer, don’t forget to reach for a cool drink, a bottle of sunscreen and a copy of Iced Chiffon. What a great collection of short stories. The author and her mother, Eleanor and Dorothy Cawood Jones, share billing with a nice variety of style and flavor for everyone's taste. And short stories are the perfect answer to taking a book to the beach while sunning, and getting in a whole story in the time you spend before flies, heat or sunburn gets to you. Prefer sweet and heartfelt? Try the story "Burying Toby" or "The Great Milk Quest." Both have a YA feel to them. For those who prefer a bit more of a savory taste, with a solid mystery plot, quirky characters and a twist, try "Dog's Best Friend," "Exit 36" or "The Sampler." All are fabulous and unique reads. Remember, in short stories justice might have quite a different ending than in a regular long cozy mystery. They might get you thinking while walking back from the beach, too. 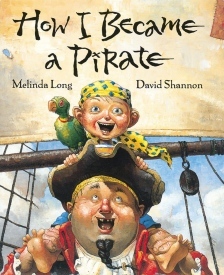 Boys and girls will love reading about Jeremy Jacob, who joins Captain Braid Beard and his crew on a real pirate adventure. It's all good fun until Jeremy discovers the other side of being a pirate... no books or good night kisses. Hmm. Maybe the grass is greener at home. 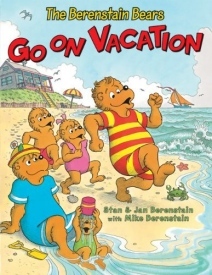 A perennial favorite, the Berenstain family -- Papa, Mama, Brother, Sister and Honey the baby bear -- heads off to the seashore to swim, fish, build sand castles and more. Great for a day at the beach or to read in the car on a vacation trip. 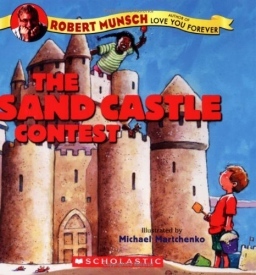 Children will love this picture book about a sand castle so real, the kid who made it has to prove it's actually sand -- and the contest prize is a bathtub full of ice cream! Yum! Will he win the contest? A great beach read. 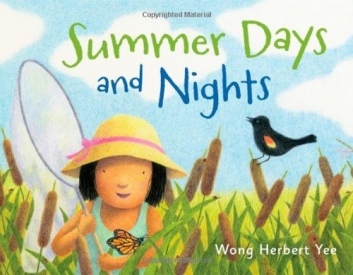 Sharing a hot summer day with readers, a little girl keeps cool by swimming, sipping lemonade, catching a butterfly and more. Lovely illustrations and the author celebrates the small things in this tale.